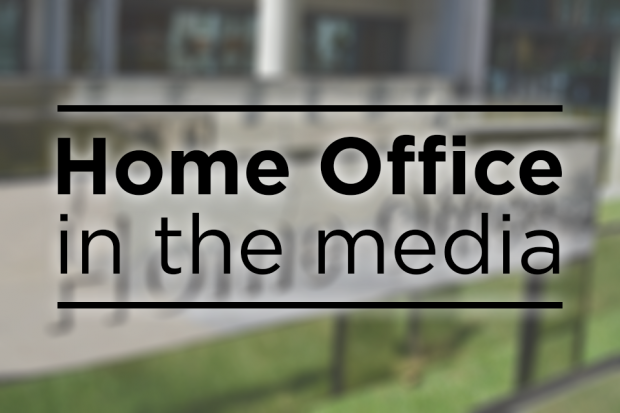 Today’s Home Office media stories include further coverage of the major incident in Amesbury and the ongoing debate around the medicinal use of cannabis. There is further widespread coverage in print and broadcast media of the couple taken critically ill in Amesbury over the weekend. The papers lead with the Home Secretary accusing Moscow of using the UK as a "dumping ground" for poison and urging Russia to explain "exactly what has gone on". The Guardian says the nerve agent may have been in a sealed container. The Telegraph reports that more than 100 counter-terrorism detectives were last night trying to establish exactly how the couple came into contact with the nerve agent . The Home Secretary gave a statement on the incident in the House of Commons yesterday. The Today Programme, BBC Breakfast and the Guardian report on the review into the medicinal use of cannabis. Today and BBC Breakfast reported that Billy Caldwell has arrived home in Northern Ireland. His mother was interviewed by BBC Breakfast and Today and said that Billy, who is autistic and suffers from epilepsy, has been "placed under hospital arrest” due to conditions imposed by the Northern Irish authorities. Hannah Deacon was also interviewed on BBC Breakfast ahead of the debate later. She said her son Alfie Dingley has benefited from the cannabis oil and said legalising medicinal cannabis will raise awareness and encourage training among doctors on the benefits of the drug. Outlets report that Home Secretary Sajid Javid has this week commissioned part 2 of the review into cannabis-related medicinal products, after the Chief Medical Officer concluded there is evidence of therapeutic benefit for some conditions.